NASA's new "AstrOlympics" project puts the achievements of Olympic athletes into a more cosmic perspective. Just in time for the Olympic Games in Rio, NASA has unveiled a project comparing the feats of the athletes to amazing things found in space. The "AstrOlympics" project, which was developed by NASA's Chandra X-ray Observatory communications group, discusses physical connections between sports and space, including topics such as speed, distance, time, mass, rotation and pressure. "AstrOlympics provides brief explanations of the physical concepts and then compares examples from common everyday experiences, Olympic events and discoveries from space made with Chandra and other telescopes," Chandra team members wrote in a statement. AstrOlympics posters and other materials will be displayed at a number of locations in the United States, Brazil, Uruguay and other countries. 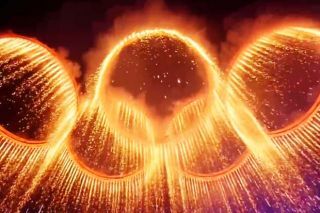 "The Olympics are an opportunity to behold the limits of human abilities in athletics," NASA officials wrote on the AstrOlympics website, where the full set of information is available. "After all, the Olympic motto is Latin for 'faster, higher, stronger.' AstrOlympics enables us to appreciate the feats of the Olympic athletes and then venture far beyond into the outer reaches of space." The 2016 Olympic Games will be held in Brazil between Aug. 5 and Aug. 21. The Chandra X-ray Observatory launched to Earth orbit aboard the space shuttle Columbia in July 1999. Seventeen years later, the telescope is still going strong, observing supernova explosions, supermassive black holes and other X-ray-producing objects and phenomena throughout the universe. You can learn more about NASA's AstrOlympics project at its website here: http://chandra.harvard.edu/olympics/website.